adorei a mistura de rosa com vermelho no mesmo look. Great colors and nice colors! I love your styling! Brilliant look of colors and the pictures are gorgeous! i love that color combination too! amazing as always! :) love the shoes. Gorgeous color combo!I absolutely love these pics! interesting color combination! love the shoes and bag very much! I love this! Red and pink with a touch of green those oxfords are beautiful! WOW !! Love the colour combo ! gorgeous outfit! I love your shoes and need them in my life. Check out my blog for a chance to win a Sephora giftcard! I really love this color combo! So easy and casual yet chic . . . Such a gorgeous mix of colors,brightens up the day! my favorite look A+, you look super stylish, love the green shoes! i m so glad that you can ‘colorblock’ even in winter!!! so gorgeous outfit!!! thank you for your fab comment…hope you keep in touch…i’ m certainly going to…!!! Another amazing color combination! I love the red sweater and the shoes are amazing!!! You don’t just wear a star, you are a star, my dear! :))) Great colourful look. I love it! Amazing look! Great blog! I follow you. Follow me too. Kiss from Poland! Beautiful look! Love all the bold colors mixed together. awesome look!Lovely combination of colors!! i love the color of your shoes. Kisses from Spain. Hello there – I’ve just found your blog and I must say I am in love with it ! I loooove the color blocking here and also the background is stunning :x Hugs ! Looove this color combo! Thos green shoes are amazing! Love the colours and the pics. Great look! your shoes are just perfect ! In love with these pictures! I love your shoes, they’re awesome! OMG! I love ur outfit! YOU ARE AMAZING!! love the outfit!! Great color combo!! You look amazing!! The star brooch is a lovely touch! Love it!! Love the pop of green…but then again green is my favorite color. Aww love your outfit. Thanks for the comment. your outfit is seriously rad! so, so cute. i’m your blog’s newest follower! stop by & say hi if you fancy. Cute outfit, love your pink pants and green oxfords! And I like your star Brooch. Amazing outfit! nice colors! I love your oxfords shoes! I really love this color combo!! Green pink and red look perfect together! I love the color combination :O!! It stands out so much! Love your fashion sense! You’re a master of colourblocking! I love this colour blocking ensemble. 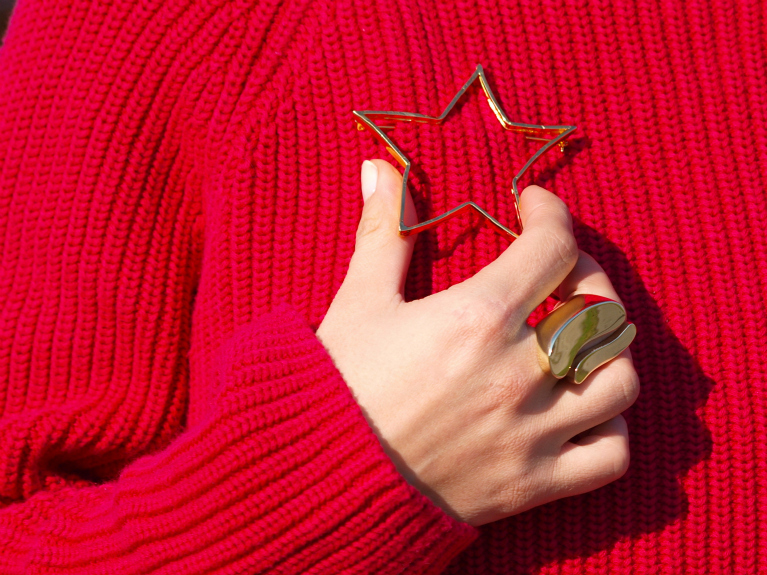 And the broche is lovely: it has a certain Miu Miu (from last season)/Acne (for SS2012) inspiration! Nice look!Nice brogues!Love him.Love color. Me gusta la combinación rojo+rosa :) Loa pantalones son geniales ^^ Feliz Domingo! I so love all the colours in this outfit – the brogues are gorgeous! I love this look, the shoes are great! Ai que delíiicia de fotos! Amazing outfit. I love how the colors complete each others. So cool. oooh! i love this color combination! although i don’t know if i could pull it off!! it’s adorable! You are so good in using colors, love it! Thank you for stopping by my site;) See you soon. Lovely color blocking outfit! Good job girl! Thanks for your lovely comment!Your blog is so cute!! Daniella thank you very much ! This is a great surprise ! Hugs lovely! Love the shoes! Great colors! i love this color blocking! it’s just amazing! me ha gustado mucho el look color block! pero en especial es bloche de la estrella y el anillo!!! The mix of colors is really great! everybody was saying color blocking was only about spring but it works for fall too!!! loove this outfit, specially the shoes! love pink and red together, and the pop of green is a great touch! I love your outfit, the color mix is amazing. love what you did with your pink jeans! great outfit love the summer trend transition into fall looks amazing! adore those shoes! With no doubt now i can call you the queen of colours! You’re like no other can do great colorful outfits!so nice! you’re amazing! thanks for the really nice comment on my blog :) i am happily following you, doll face! I just adore how you always mix up the colors creating a vivid concoction of cool and unique looks. Detailing accesnt is amazing in this post! Your are really sweet! Great look!! I love you look and the colour block!!! your shoes, i need them! Those shoes are amazing! The whole mix of colours is genius. Great photos. I admire how well you have winterized the color blocking trend. You do it seamlessly! Colorful post… like it so much :)!!! Omg, I’m completly in love with your shoes! they’re so beautiful! I love! 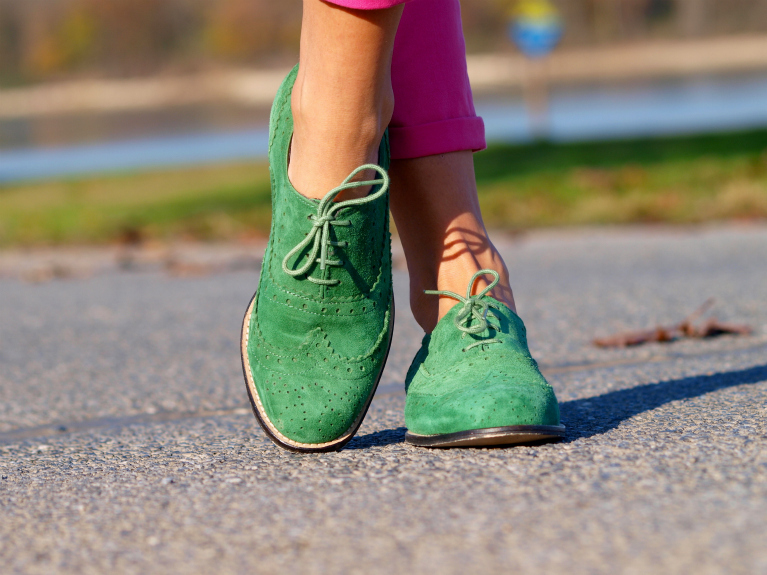 Amazing green shoes! Follow you now!! I love you blog !! Love these bold colors! Such a fun outfit, and cozy and comfortable too, I just love it. Thanks for stopping by and commenting! Lovely blog here, all great outfits and you carry them so elegantly. If you like my blog too, we can follow eachother. amazing shoes !!! great look !!! I just found your blog today…and I’m obsessed with your style!